Services are scheduled for 9:30 a.m. Thursday, Dec. 17, at Our Lady of Grace Catholic Church for Cruz Lopez Acosta of Artesia. Acosta, 76, passed away Friday, Dec. 11, 2015, at his home. Fr. Martin Cornejo, OFM, will officiate at the services, with interment to follow at Woodbine Cemetery. Pallbearers will be Matthew Hernandez, Cilio Cruz Hernandez, Tino Hernandez, John Baca IV, Simon Rendon, Tomas Najera and Mark Salgado. Honorary pallbearers are all of his friends and family. Cruz was born July 10, 1939, in Atoka, the son of Cruz Acosta and Pablita (Benavidez) Acosta. His mother died at an early age, and he was raised by Mama Julianita Carillo Lopez in Ruidoso. He attended Ruidoso schools, St. Michael’s Catholic School in Santa Fe, and graduated high school in Artesia. 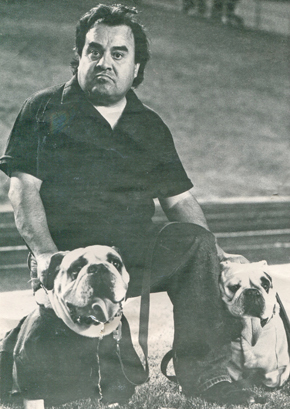 He was the manager of the Artesia Bulldogs in the 1950s for four years and later in life became the owner of Humphrey and Babe, the Bulldog mascots, in the early 1990s. He was a longtime Artesia resident. On April 18, 1962, he married Isabel Baca in Carlsbad. Cruz loved the Bulldogs and the Dallas Cowboys. He was in Golden Gloves as a boxer in his younger years and coached boxing, Little League baseball, Catholic Youth Organization basketball, and the Artesia Head Start Mini-Olympics. He was an active member of Our Lady of Grace Catholic Church, a Crucillista, and and had served mass for the archbishop in Santa Fe and the members of Our Lady of Grace with Fr. Steven Bono in Artesia. He pioneered the senior citizen nutrition program in Chaves and Eddy counties, established meal sites in Roswell, Midway, Hagerman, Artesia, Carlsbad and Loving, and was instrumental in obtaining money to build the Artesia Center to serve the needs of the youth and elderly. He loved his family, dogs, and many friends, and he enjoyed music and making people laugh. Survivors include his wife, Isabel Acosta, of the family home; daughters Ginger Acosta and Lorraine Hernandez and husband Tino, both of Artesia; grandchildren Ava L. Acosta, Matthew Hernandez and Aimee, and Cilio Hernandez and Destiny; great-grandchildren Zachaysa, Makayla, Sammy, De’Angelo and Mila on the way; sisters Chavela Acosta and Josie Najera, both of Hobbs, and Flora Lowrey of Pembroke, N.C.; and numerous nieces and nephews. He was preceded in death by his parents; Mama Julianita Lopez; son Howard Acosta; daughter Judy Acosta; sisters Susie Rendon Ignacia Lozano, Virginia Sanchez, Elena Everheart, Geneva Hernandez, Anna Almanza and Maria Polaco; and brothers Inez Acosta, Adolfo Acosta and Max Lopez.